Teamsters handle freight, lay carpet, install booth, and perform all decorator and rigging work. Riggers must hang overhead signs or any signs that require a forklift. Any signs that are hung on the booth, can be handled by the EAC. Please note that while the exhibitor services manuals state that exhibitors may set up and take down their own displays, may use hand tools, may carry in items into the hall, and may use a wheeled cart or dolly – the teamsters are not on board with this policy and you will very likely be stopped from working. Boston is one of the only cities in the United States that has closed halls (where you truly must use the labor supplied by the hall). 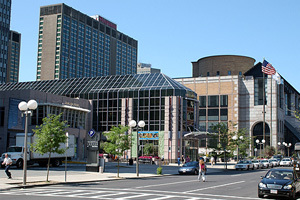 The Hynes Convention Center is an open hall, which allows the use of an Exhibitor Appointed Contractor (EAC) such Absolute I&D to perform installation and dismantle work. Electricians handle the electrical work, plumbers the plumbing work, and stagehands handle in booth staging. Everything electrical, other than hardwiring, can be done by electricians, the labor contractor, or the exhibitor. As long as electrical services are paid for, the work can be done by an EAC. Exhibitors do not have to purchase a different drop cord for every device. The EAC can plug in up to eight times on one cord (unlike the labor section above, everyone in Boston is on board with the electrical “freedom policy”). Power may come from either floor or the ceiling. Check your venue and your booth space, as well as your electrical requirements. Extension cords are required to be 14 gauge, either flat or round, and can be supplied by the exhibitor. If you would like to receive a free quote for you trade show exhibit installation and dismantle in Boston, please call us at 1-866-685-8950 or complete the form below to have someone reach out to you.